How difficult was the hike Steve? When we visited the Canadian Rockies half a year later we saw many more glaciers, but of course not a single tree fern. I don’t know whether in a place like Ecuador you can also find that combination, which sure was striking in New Zealand. And striking, of course, on a smaller scale, were the many patterns and textures like the five shown here. The hike wasn’t bad. The uphill parts, which are never all that steep, mostly come on the way to the glacier, when one is freshest; the walk back from the glacier is therefore welcomingly easier. Another advantage is that the foot of Franz Josef Glacier is near the coast. In contrast, some of the scenic hikes we took in the Canadian Rockies were at oxygen-robbing altitudes that had me walking slowly and pausing periodically. Ah, yes. I know that technique. “Just stopping to take a photograph, darling”. I don’t do well at high altitudes. Eve does noticeably better. You’re welcome. There were so many interesting things, large and small, that I stopped in lots of places to take pictures. Beautiful area for artists and looks like a fascinating area for geologists, too. And for photographers (unless you’ve already counted them among artists). I gather from what I see online that geologists have spent a lot of time studying the Southern Alps, the mountain chain in which Franz Josef Glacier is located. 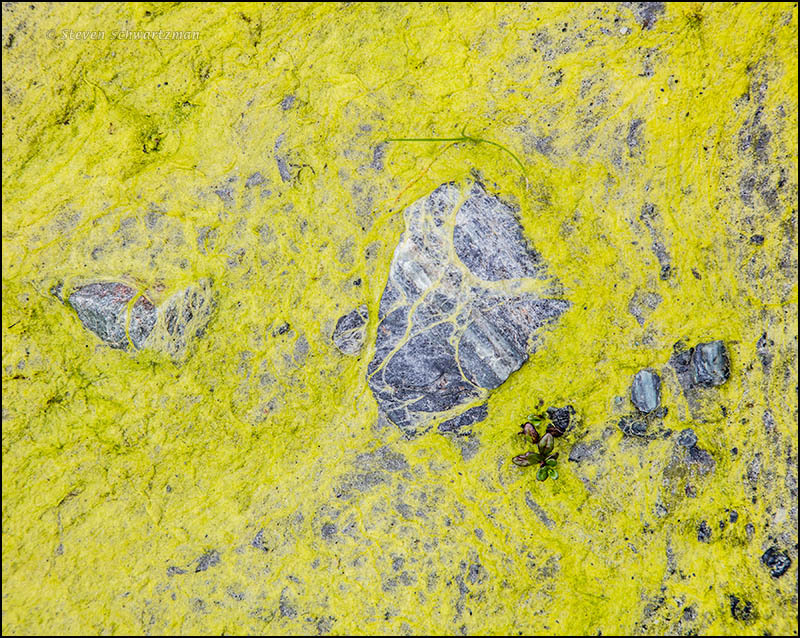 Inspirational, showing nature’s abstractions and variations through intimate views. Glad to hear the pictures inspired you. The many small things were bonuses that neither our guidebook nor any online source had prepared me for. The one hint, and a retroactive one it is, were some interesting rocks lining walkways on the grounds of the hotel. The detail you captured is quite stunning. Those tree ferns do not seem to fit with that chilling background in the landscape photo. It looks tropical… but not. It makes me curious about the ecosystem in that region. I think that with the exception of New Zealanders almost everyone is surprised to find tree ferns in the same picture with a glacier. My impression of the ecosystem in that region is that there are actually many, with various microclimates created by the configurations of the land, the altitude, the proximity to the glacier, etc. When we were there it was summer and the weather was quite pleasant, which is why so many other people were there too. On the other hand, the region that includes Franz Josef Glacier is far enough south that it undergoes real winter. Thank you! Forrest and I plan to visit someday! Then you can walk through the forest with Forrest. That must have been a very pretty hike! It was, and not arduous. We spent at least three hours on it, including all the times I stopped to take pictures. Beautiful, and as promised you gave me blue ice to go with the pink snow. Loving all those colors and forms in the the rocks and moss. I was uncertain about the composition of the first gray photo. Rock with crystals? The French have a saying: Chose promise, chose due; Something promised, something due. It can be hard to interpret blog-sized photos. 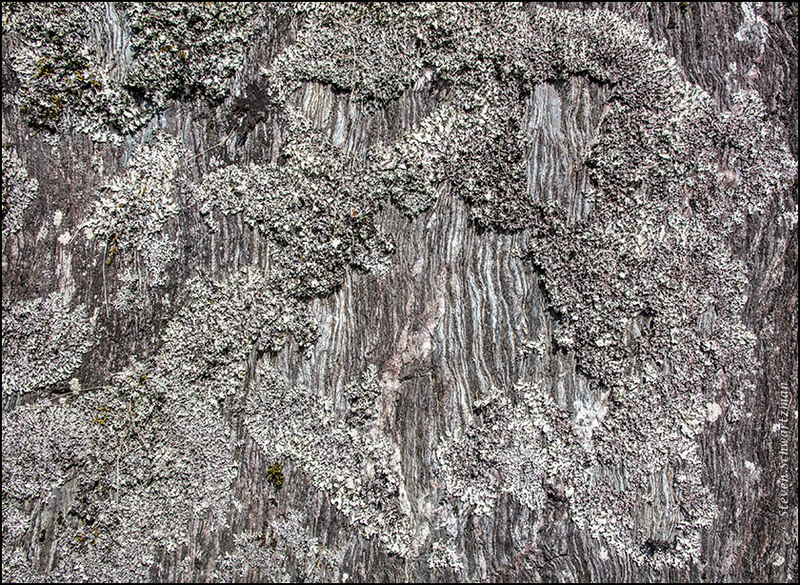 It’s not crystals but pale lichens you’re seeing in the gray picture. 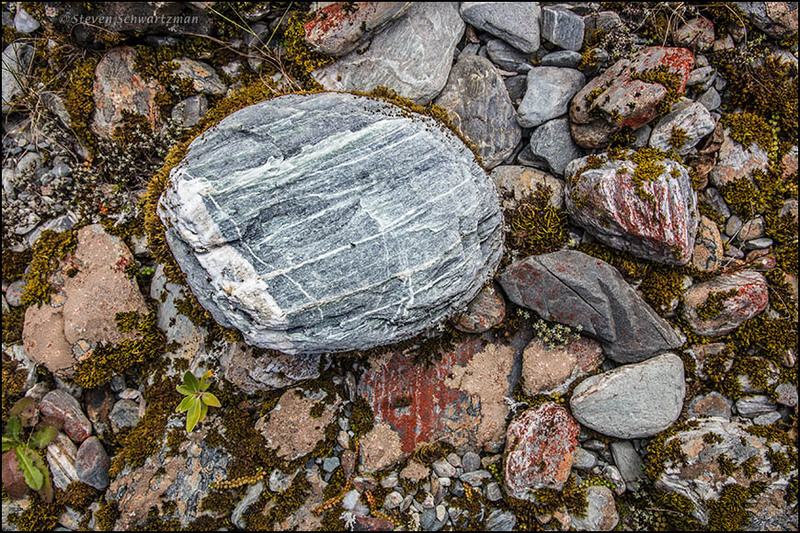 They’re growing on rock layers that have been turned a full 90°. 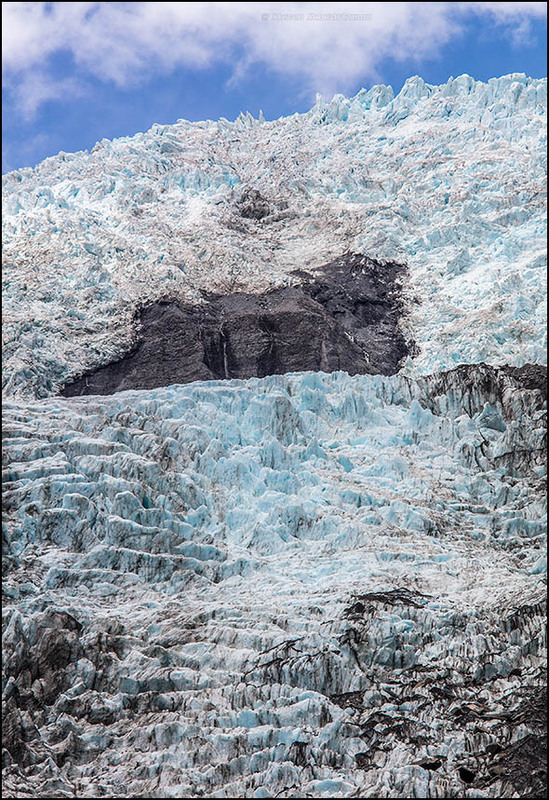 When I visited Alaska’s Glacier Bay, the glaciers we cruised among were marked by that same beautiful blue. If I had to pick just one memory from that landscape to keep, it might be the ice — although the Orca whales were compelling. 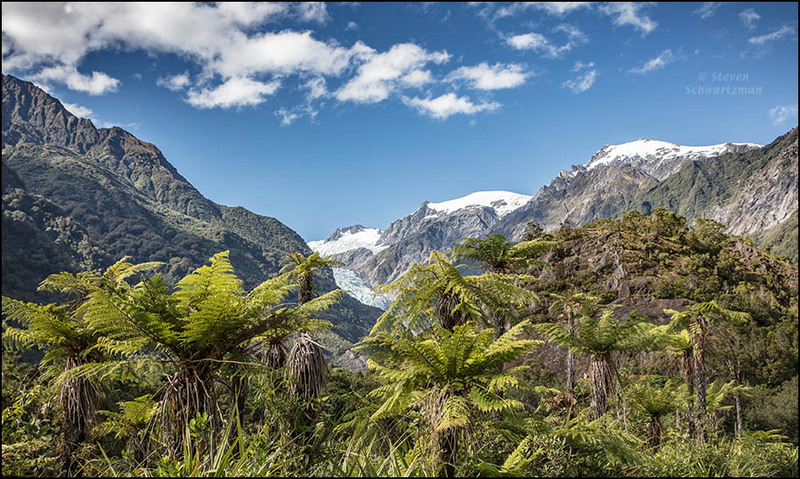 On the other hand, the combination of tree ferns and glaciers is one of those juxtapositions that hardly seem possible, and that make New Zealand’s uniqueness obvious. I’m especially fond of the swirls in the third detailed photo, and the strong sense of flow there. Your photo of the reddish growth on the rocks made me wonder if it might be the same as some I photographed on the Willow City Loop. Surely not, but the appearance is similar. I’d seen that glacial blue for decades in photographs and television documentaries, so it was high time to see it in person. An episode in a geology series we recently worked our way through highlighted Glacier Bay; you’re fortunate to have experienced it for real. 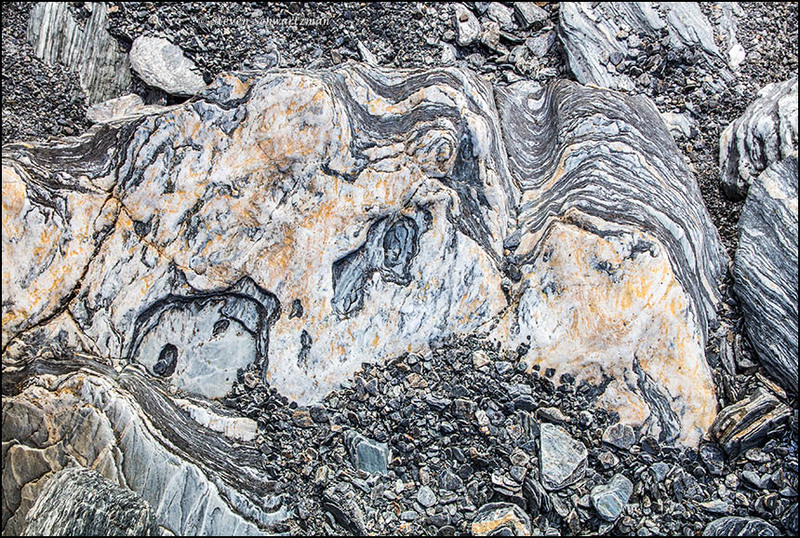 The swirls you singled out in the third detailed photograph characterize a lot of the rocks we saw near the glacier and again a few days later on the shore of Lake Wakatipu. 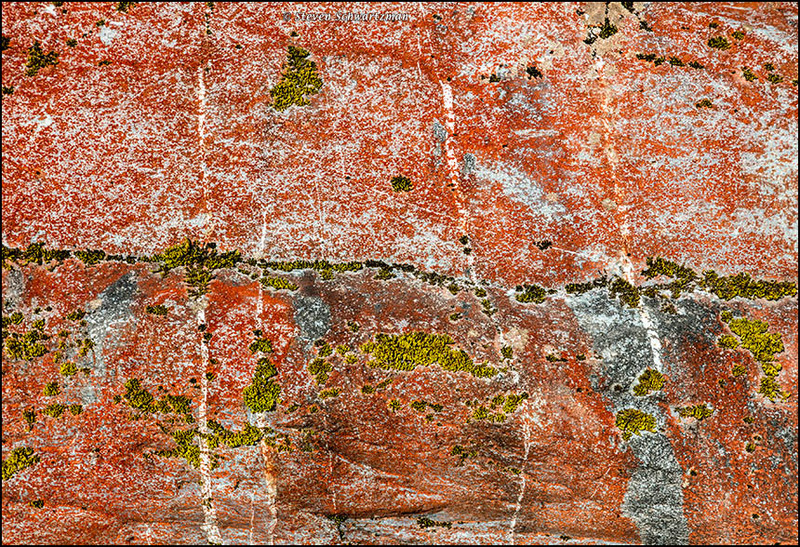 In Texas I’ve never seen small reddish lichens like the ones so common near the glacier. If there are any in Texas like that, I assume they’d be a different species, given the very different climates and the huge distance apart. It was easy to get good images in such a scenic place. I particularly like the last one. You really have a good eye for the abstract. Incidentally, I read that the ice on Lake Michigan has turned blue. I’d love to see it but I think they mean at the top of the lake, some 5 hours north of here. Down at this end the ice has mostly melted. Thanks. You’re the only person who’s commented on the last picture. Yes, I’m crazy for abstractions. Maybe you can get together with one or more people to go up to the north end of the lake and see the blue ice.